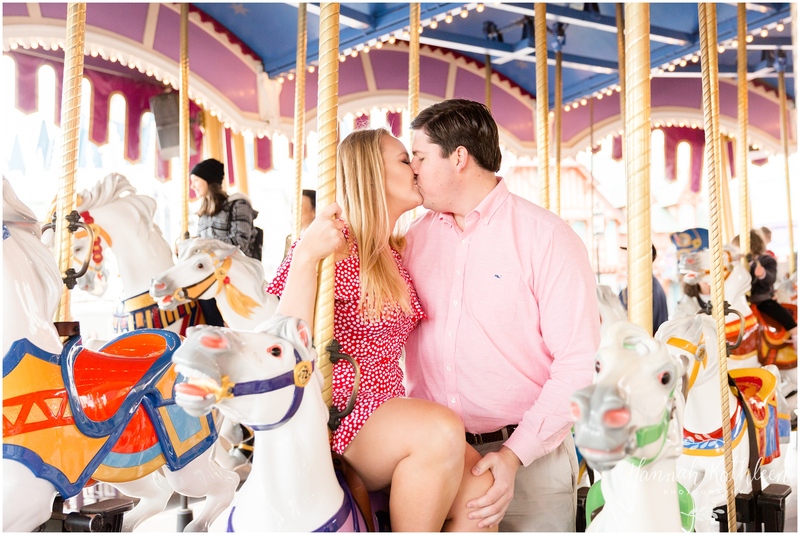 Jake and Kelly’s engagement session took place in my TWO favorite parks! 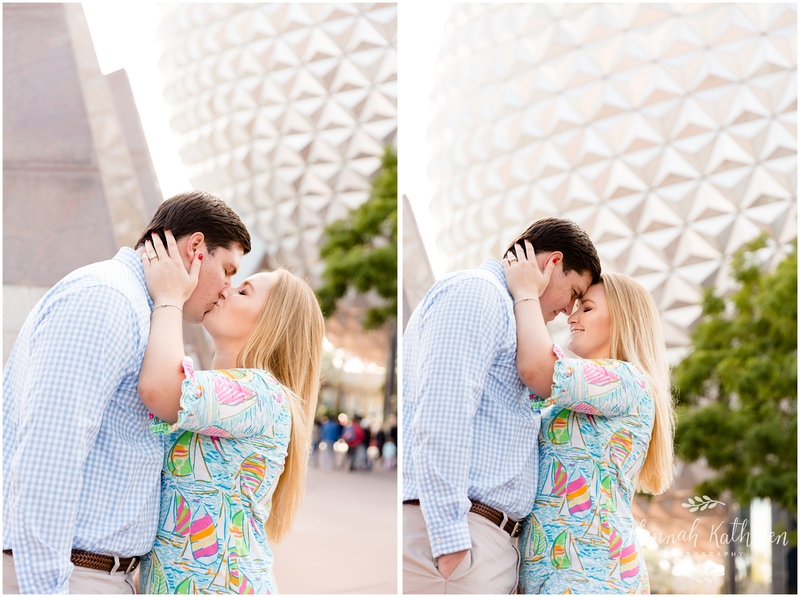 Magic Kingdom AND Epcot! My favorite pictures are at the very end, so if you skip the rest, at least scroll to those! 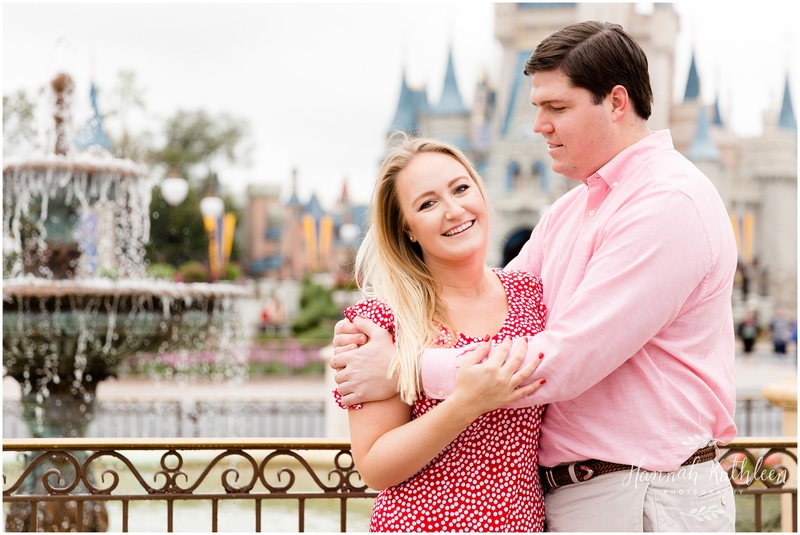 When I got a message from Kelly asking about pictures, I found out right away that she was FRESHLY engaged! Jake proposed just a couple weeks before she emailed me (September 2018). 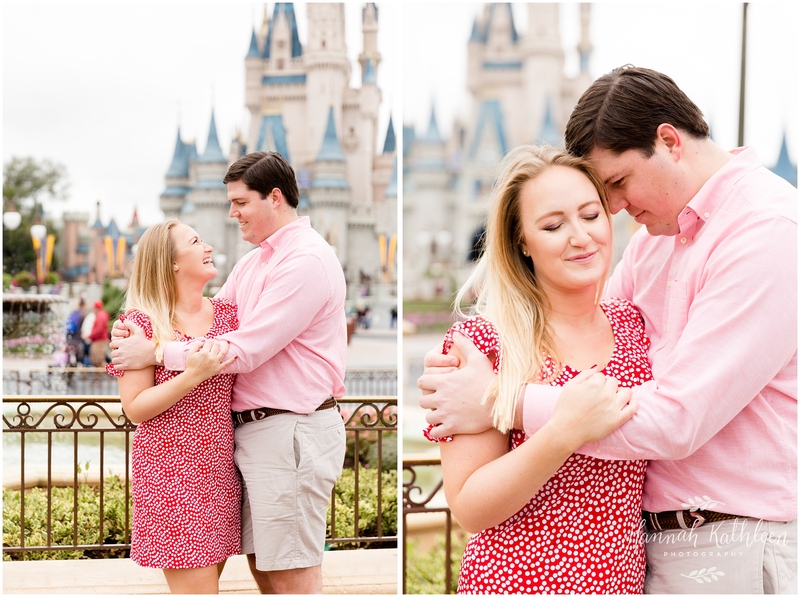 First of all, I loved how eager she was to book a session with me months before the Disney trip! YAY! Second of all, let me tell you how Jake proposed!!! 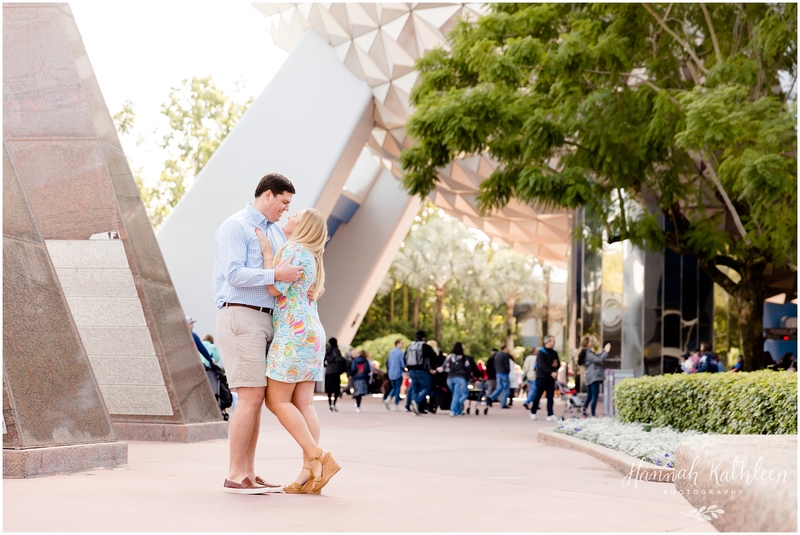 They spent a romantic evening having dinner at California Grill at the Contemporary Resort. Afterward, Jake surprised her with a private boat cruise along the lagoon during the FIREWORKS! 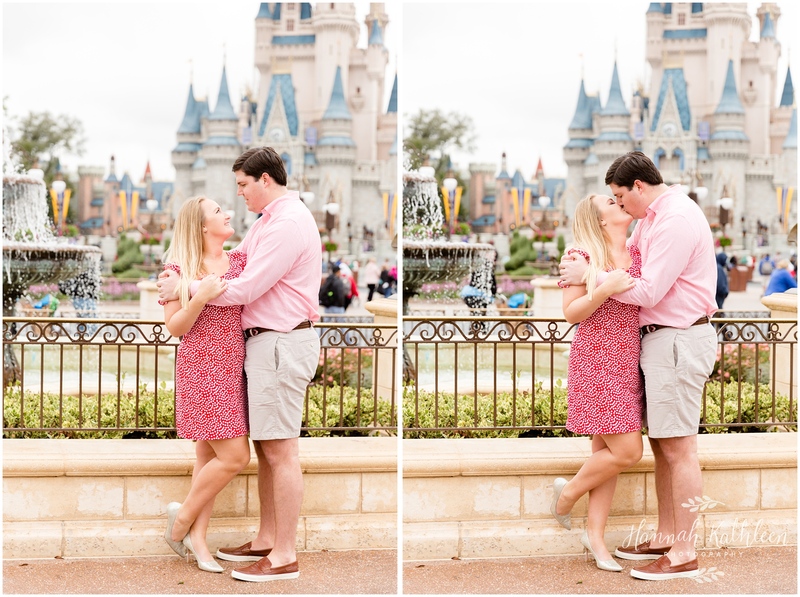 He proposed on the boat during Happily Ever After… Sounds like he’s a keeper, right!? 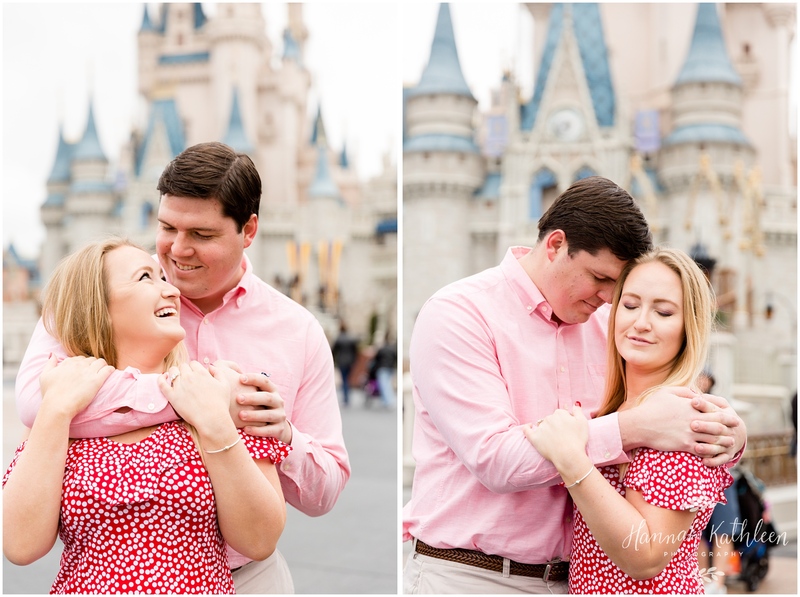 If that story doesn’t tell you enough about these two, I hope these pictures will give you a glimpse into the joyful season of engagement they are experiencing now! 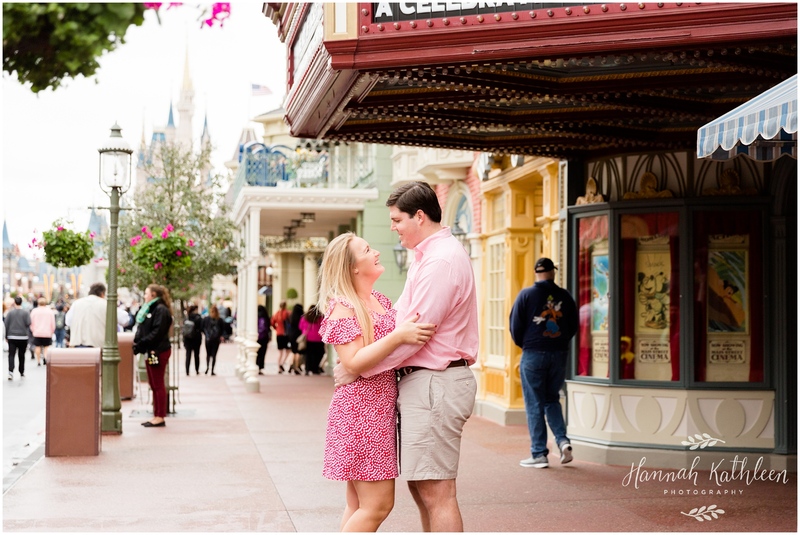 We started our session right in front of the castle at the end of Main Street USA in Magic Kingdom! 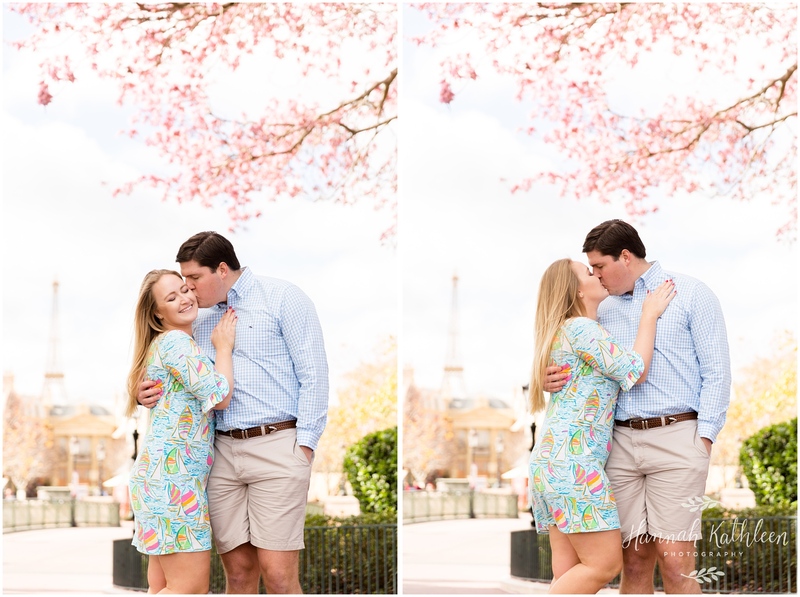 Jake and Kelly were a joy to photograph (and so easy, too!). They’re naturals and I couldn’t give them a pose they couldn’t handle. Right at rope drop, everyone heads to the rollercoasters! Not us… we headed straight for Dumbo. 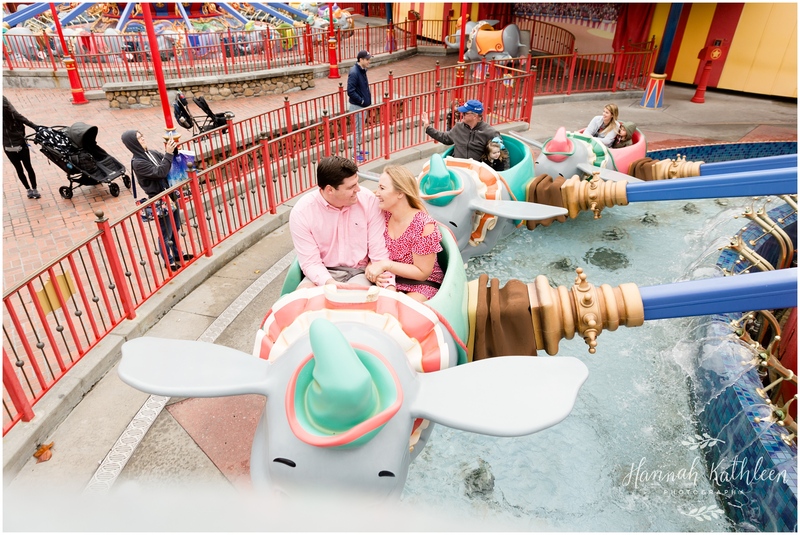 Another reason Jake is a keeper… he crammed into a tiny flying Dumbo for the sake of pictures… and he’s tall! YAY JAKE! 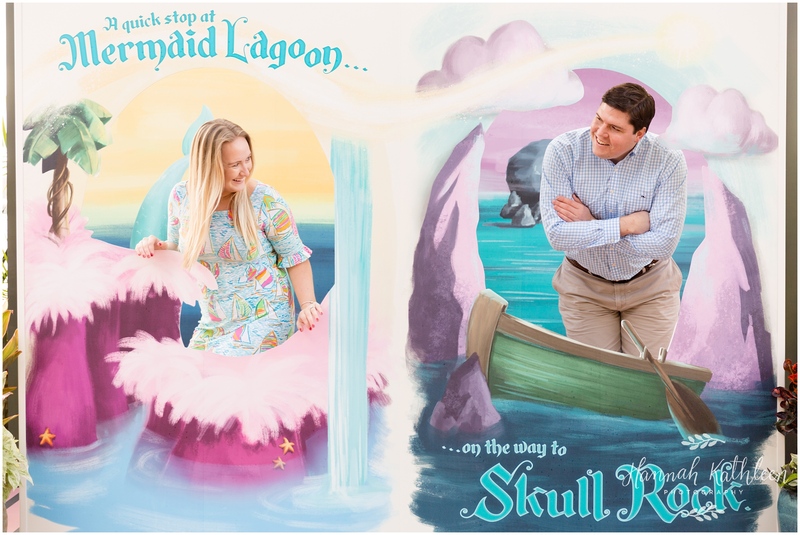 After Dumbo, we took the scenic route through new fantasyland. 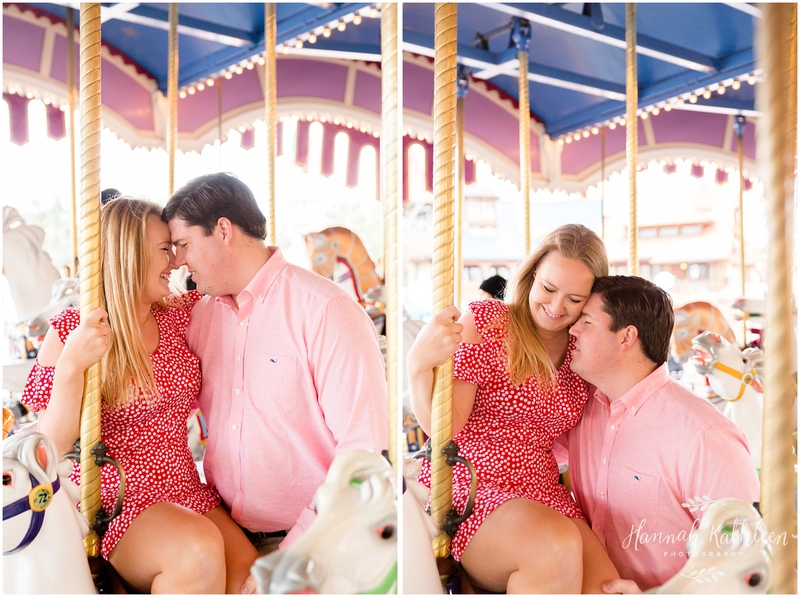 Our next destination was the carousel! How much fun are these photos!? After we finished up in Magic Kingdom, we had a Minnie Van waiting for us (thank you Kelly!) to take us to Epcot! 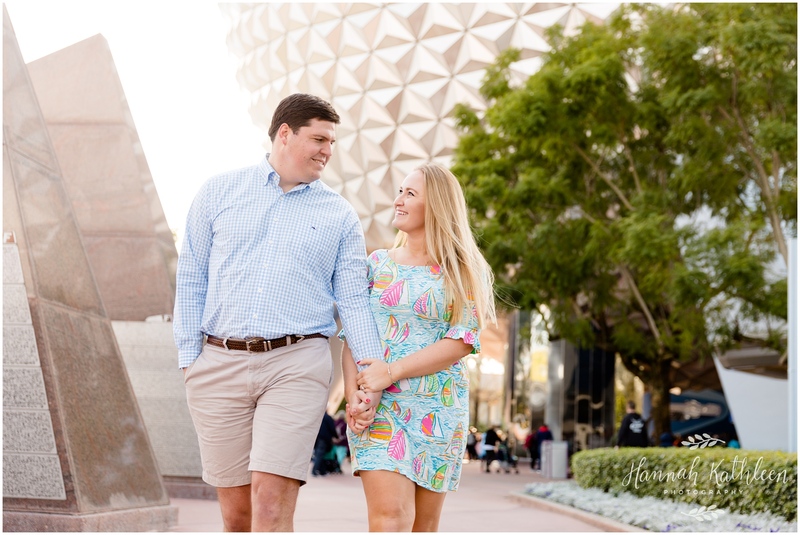 I never get sick of photos with Spaceship Earth in the background. A few fun stops along the way… but we had a place in mind to finish our session… France! 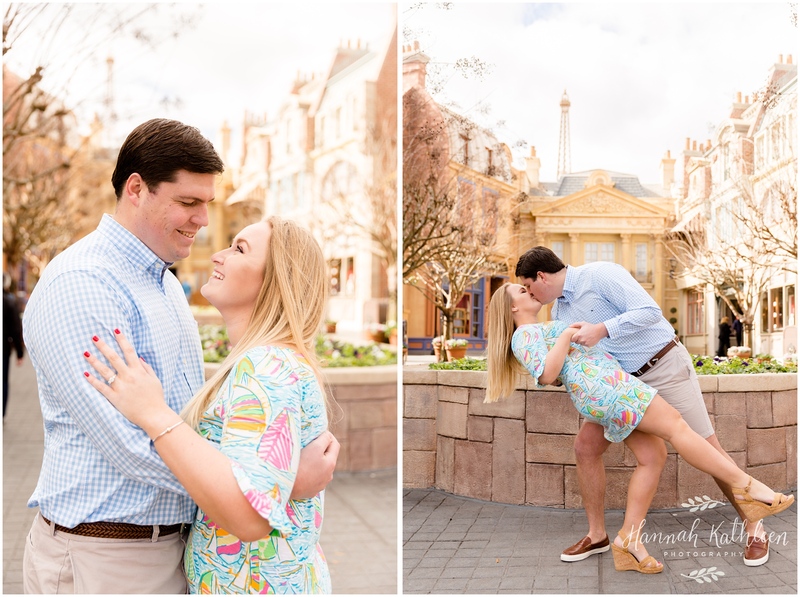 While strolling up to the France Pavillion, I mentioned to Jake and Kelly that I was waiting for someone who wanted pictures in Epcot because these trees recently bloomed the most gorgeous pink flowers… and there was one tree I had my eye on in front of France! 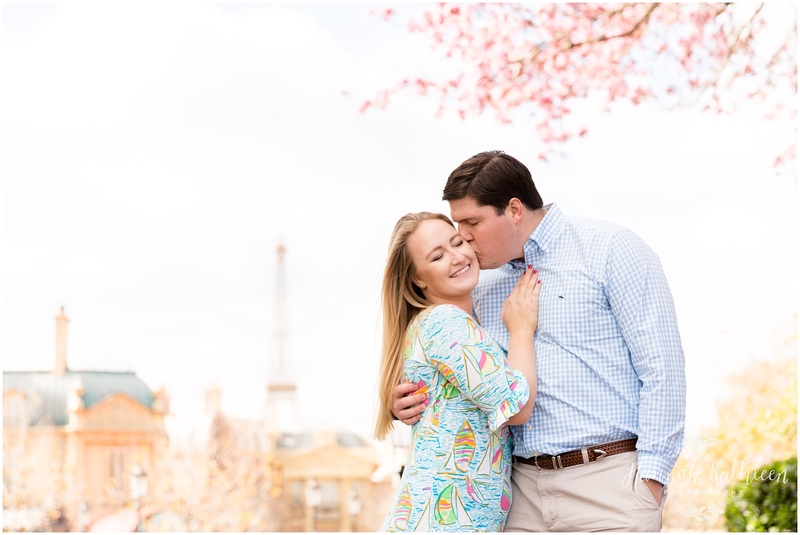 Well… guess what, these two were so easy-going and trusted me with all the locations, so we took quite a few pictures with this pink tree framing the Eiffel Tower and I couldn’t be more obsessed with these ones! I hope you like them, too! 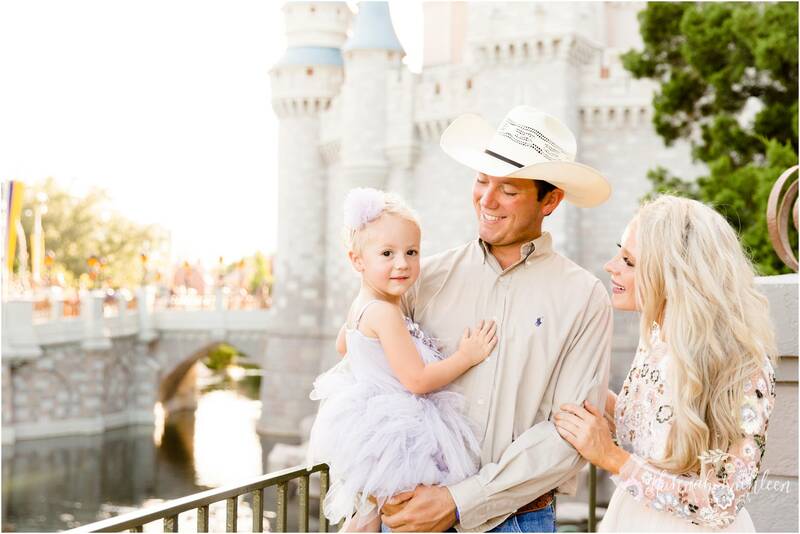 Jake and Kelly, congratulations on your engagement in the most magical place on earth. I am grateful that you reached out to me for photos, and that you were two of the easiest people to work with. I had a blast and I’m grateful for our time together!! Thank you! And happy wedding planning!! Hop on over to my website and say “hi!” Follow along on facebook or instagram! 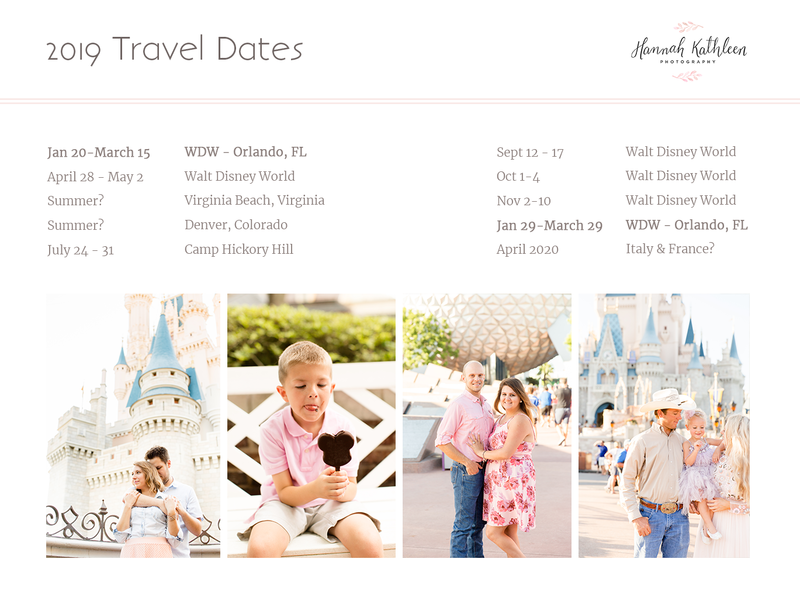 Take a look at my travel calendar and let me know if you want photos anywhere! 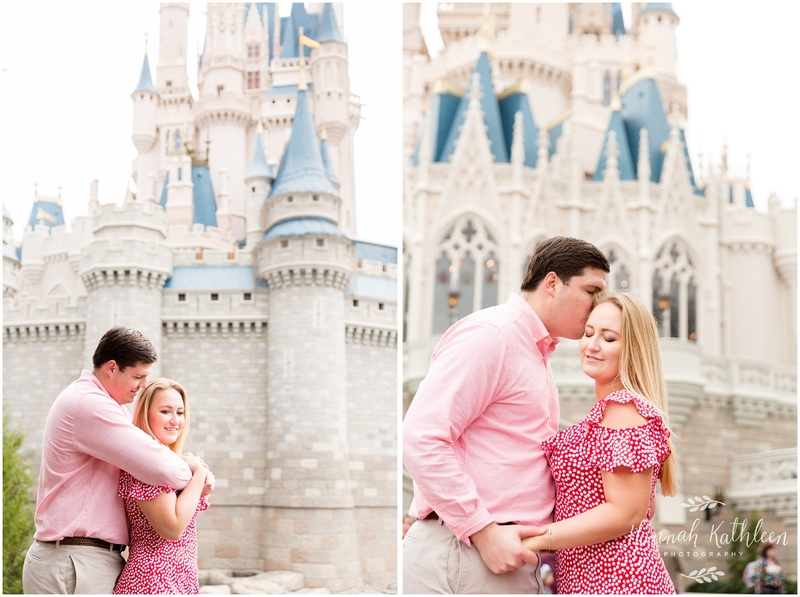 Also, if you have a Disney trip planned, message me regardless of your dates, you bring me there and the photos are yours! Yay! (And I’m happy to set you up with some tips and advice before your trip if you’re looking for help with anything!) And yes, that isn’t a typo on my travel calendar… we are “snow-birding” near Disney World in Florida for at least two more weeks! 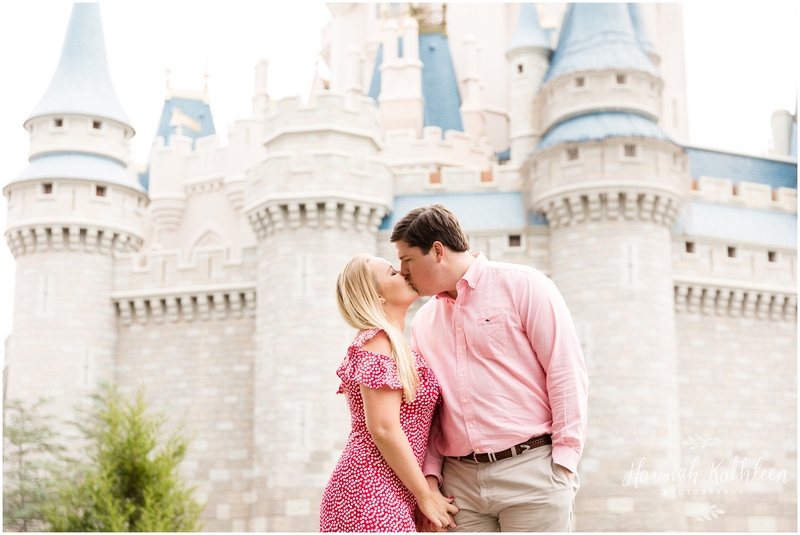 And I’m available to take photos all around Orlando! Introduce yourself… I love making friends!